If you liked/own the first Mamma Mia! film and /or you are a fan of ABBA music then this is the movie for you. 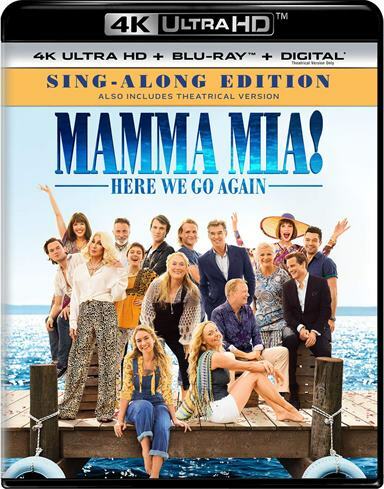 If you love music from the 1970's Swedish pop group ABBA then you surely loved 2008's movie based on the musical filled with their songs, called Mamma Mia! If, like me, you aren't a fan, then that movie and this year's sequel, Mamma Mia! Here We Go Again certainly weren't your cup of tea. Luckily for the former grouping, the second film is set to be released on 4k, Blu-ray and digital download. Not only can you enjoy the movie and the music but the 4K also offers a special sing-along edition so you too can "get your groove" on. In this second (and hopefully final) installment, we catch up with Sophie (Amanda Seyfried; Mean Girls) as she lives on the Greek Island that her mother Donna (Meryl Streep; The Devil Wears Prada) called home. Sophie finds herself at a crossroads opening the hotel her mother always dreamed of – a year after Donna's passing- while discovering she is pregnant even though she and her husband, Sky (Dominic Cooper; Preacher) are separated. As Sophie takes on this new chapter in her life she can't help but think back to what brought her mother to Greece and the three men she was involved with when Sophie was conceived. Flashback to young Donna (Lily James; Baby Driver) as she meets and beds Harry (Hugh Skinner; Les Miserables), Sam (Jeremy Irvine; War Horse) and Bill (Josh Dylan; Allied). Donna eventually discards each of her male suitors for one reason or another even though one of them is Sophie's Dad (That mystery was solved in the first film though all three men claim Sophie as their child). Determined to "be there" for Sophie the men descend on the Island in celebration for the grand opening of the hotel. Also attending, much to her chagrin, is Sophie's estranged and flamboyant Grandmother Ruby (Cher; Moonstruck). Through cheesy musical numbers and flashbacks, all their issues seem to get resolved. The problems with this film are numerous and widespread. Let's start with the music. Even if you like ABBA this film offers mostly what would be considered their "B-sides" if not their "C-Sides "(if that even were such a thing). Most of the group's greatest hit were used up in the first film and these song simply aren't as good and are thrown in the film for the hell of it, making for awkward transitions. Next up – the script. Because of the flashbacks, the pacing is disjointed and nonsensical. There is so much going on throughout the movie that there is no time to focus on one element and really develop it. Finally, let's discuss the scenery. Where it is real, it is magnificent and it could serve as a commercial for the Tourism board of Greece. However, where it is fake, it is obviously and annoyingly fake. This leads me into the 4K video quality, which is excellent but once again negatively showcases the "fake" scenery in obvious contrast to the real settings. The 2160p resolution accentuates the good, the bad and the ugly making for a disjointed movie. The Dolby Atmos is a treat aurally even though the music is less than stellar. The audio showcases the soundtrack beautiful with full and rich tones and makes me wonder what it would have been like with songs from a different band. Besides the Sing-along, which could be fun for the right person I guess, the combo pack comes with a plethora yet short extras including thing such as Curtain Call, Performing for Legends, Cast meets Cast, The Story, Playing Donna, etc. Some of these are actually more entertaining than the film itself. If you liked/own the first movie and /or you are a fan of ABBA music then this is the movie for you. However, if you are like me and don't particularly like their songs then this is one 4K I don't think you would run out to own. Download Mamma Mia! Here We Go Again from the iTunes Store in Digial HD. For more information about Mamma Mia! Here We Go Again visit the FlickDirect Movie Database.